Ritchie Blackmore and Candice Night have been carrying the torch for Renaissance music for more than fifteen years now, and they have relentlessly pushed the borders of tradition with their signature sound and style. With a perfect blend of angelic vocals, acoustic and electric guitar runs, and mesmerizing woodwind workings, their latest release, Dancer and the Moon, is yet another jewel in their crown. If you are familiar with the other offerings in the Blackmore's Night catalog, you will find Dancer and the Moon a perfect fit, stylistically. 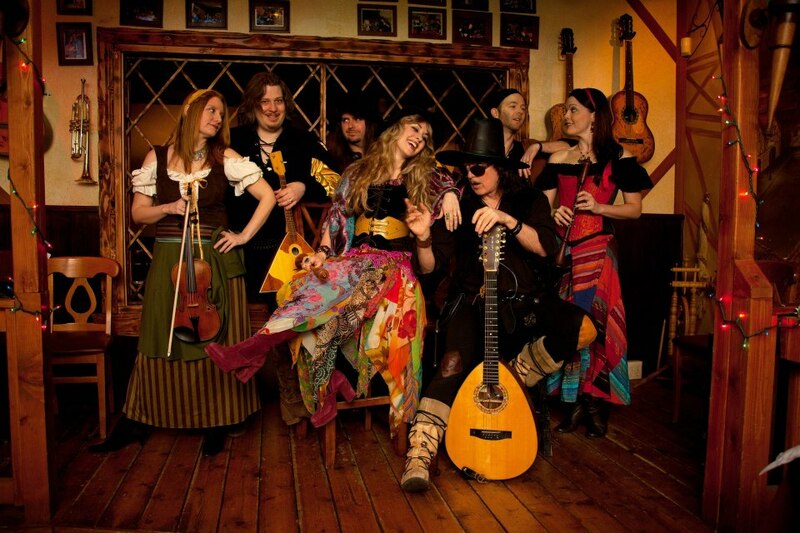 Nobody does Renaissance Folk the way that Blackmore's Night does, and they stick to what they do best here. Opening with the Randy Newman classic "I Think It's Going To Rain Today," they manage to reinvent a song that has been covered by dozens of artists over the years. Whether you know the Neil Diamond rendition or the Joe Cocker take on it, you're in for a fresh, revitalized version of the tune. With orchestration and wailing guitars layered underneath the uplifting and inspired vocals of Candice Night, this is a memorable opener. This leads right into a song that was found by Ritchie Blackmore on Youtube, of all places. What started as a theme song for an Ukranian soap opera, "Troika" became a vibrant piece of the Blackmore's Night catalog with a few alterations to the music and lyrics. As "Troika" ends with a fist in the air and an uprising chant of "Hey," it is followed by one of the deepest, darkest pieces that the band has ever done. Lead by the acoustic hand of Blackmore's guitar and wrapped in the velvety voice of Night, "The Last Leaf" is a masterwork. Once Night delivers the line "that Summer would turn to Fall, and the Autumn would turn to ice," and then the small bit of dark orchestration hums in the background, tears ran amok on my face. Powerful.... Powerful. Now the band is ready to show their power in another way. "Lady In Black" is a cover of an Uriah Heep classic, and it is riveting. Between the dark chanting that builds throughout the song to the smooth fretwork of Blackmore's electric, this is even darker and heavier than the Heep original. A small guitar interlude entitled "Minstrels In The Hall" separates one hard rock classic from yet another. "Temple Of The King," taken from the Rainbow debut, is a song with a melody that has a snug fit with the Blackmore's Night style. Where the band went heavier than the original with "Lady In Black," I think "Temple Of The King" takes on a slightly softer tone here. The band returns to a more traditional Gaelic sound with the title cut, complete with shouts and handclaps. A tune fit for the pub, no doubt. "Galliard" is another short guitar interlude, but this one gets quite elaborate. With added percussion and some orchestration, "Galliard" ushers in a brief lullaby named "The Ashgrove." This is when I really wonder about Candice Night's mortality. She sounds simply enchanting and otherworldly. "The Ashgrove" is a great precursor to what lies in front of it as well. "Somewhere Over The Sea (The Moon Is Shining)" is a soft, melodic ballad that is mainly Blackmore's acoustic and Night's voice. Later in the tune we get a plugged in Blackmore doing some detailed soloing, but the song is fairly secure in its direction as a mid-tempo ballad. It is after this song that the band kicks out something I haven't ever heard from them, an 80's style electronic keyboard riff. "The Moon Is Shining (Somewhere Over The Sea)" is the pumped up, rocked out version of its ballady counterpart "Somewhere Over The Sea (The Moon Is Shining)." Even though these two songs may be the same on paper, the adaptations make them dramatically different. This is definitely the most energized song on the album, which in turn makes it a slight departure from the Blackmore's Night norm, and it's all good. Now, as the album starts to wind down, we get another dark descant known as "The Spinner's Tale." Similar to "The Last Leaf," this has a deep, gothic feel that is both peaceful and haunting at the same time, hence the beauty of it all. But more than that, it is the perfect song to bring us to the final track, "Carry On... Jon." This is an instrumental track written for Blackmore's former bandmate, the late great keyboardist of Deep Purple, Jon Lord. This tune has some of the most inspired guitar playing that Blackmore has ever delivered. When the keyboard solo kicks in about 3/4 of the way through the tune, you can't help but be moved. I am one that believes that Blackmore's Night is continually escalating, with each and every release being more impressive than their last. I thought their 2006 release, The Village Lanterne, was finally the peak of their mountain, but they ascended past that peak with 2010's Autumn Sky, and now they're doing their thing on some unknown astral plain. All I can say is that Dancer and the Moon is nothing short of Heavenly.